Coverage of the 1985 Seminar: "Hemingway: A Moveable Feast"
Presenters: James Brasch, Philip Caputo, Scott Donaldson, Robert Gajdusek, Patrick Hemingway, Jo August Hills, Allen Josephs, Donald Junkins, Bernice Kert, Frank Laurence, Timothy O’Brien, George Plimpton, Michael Reynolds, William Robertson, Charles Scribner Jr., Joseph Sigman, Paul Smith, Robert Stone, and Linda Wagner. 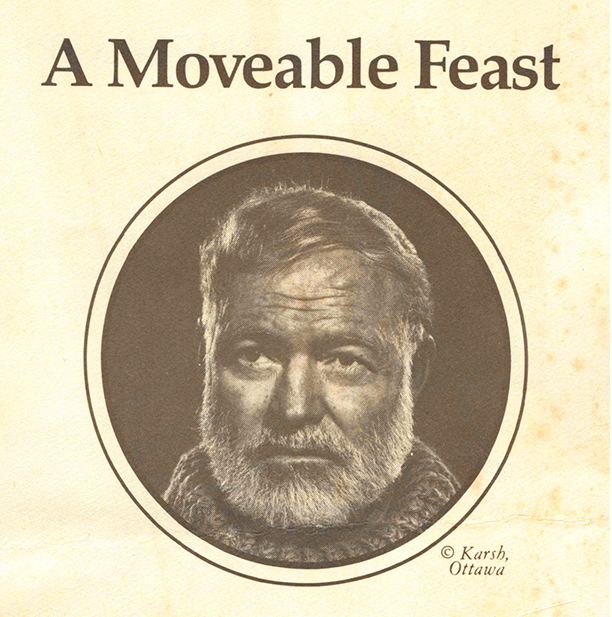 A banner for Hemingway: A Moveable Feast, the Third Annual KWLS. Patrick Hemingway poses besides a painting of his father, Ernest Hemingway, at the Martello Museum. James Nagel, president of the Hemingway Society, poses for a photo in front of the Martello Museum. KWLS board member Marianne Lancaster with copies of the Hemingway: A Moveable Feast poster. (L-R) Honorary chairman William Robertson, Patrick Hemingway, KWLS founder David Kaufelt and Charles Scribner Jr. during a luncheon. The audience for the luncheon with Patrick Hemingway. (L-R) President of the Council for Florida Libraries Frederick Ruffner, Patrick Hemingway, President of the Hemingway Society James Nagel and honorary chairman William Robertson. Dr. Henry Cooper of Columbia University poses with his wife Barbara Cooper during the reception at the Martello Museum. Lista Foster, Jean Trebbi and KWLS founder David Kaufelt pose during a reception at the Martello Museum. A banner for Patrick Hemingway on display at the Hemingway House during a reception. (L-R) Hilary, Patrick, Lorian, Carol and Mina Hemingway during a reception at the Martello Museum. (L-R) Florida Secretary of State George Firestone, Mayor Richard Heyman, Key West philanthropist Anne McKee, and Patrick Hemingway pose for a group photo during a reception at the Hemingway House. (L-R) KWLS founder David Kaufelt, Florida Secretary of State George Firestone, KWLS board member Marianne Lancaster and Mayor Richard Heyman at a reception at the Hemingway House. Writer Thomas McGuane with seminar attendees during a reception at the Hemingway House. Patrick Hemingway with an attendee during a reception at the Hemingway House. Writer Les Standiford and Kimberly Standiford pose with Florida Secretary of State George Firestone during a reception at the Hemingway House. Author of "The Hemingway Women: Those Who Loved Him - the Wives and Others" Bernice Kert and Lista Foster pose for a photo during the seminar at the Tennessee Williams Fine Arts Center. Founder of The Paris Review George Plimpton (center) during a coffee break at the Tennessee Williams Fine Arts Center. Jack and Sylvia Shorstein during the seminar at the Tennessee Williams Fine Arts Center. President of the Council for Florida Libraries Frederick Ruffner on stage at the Tennessee Williams Fine Arts Center. Charles Scribner Jr. of the Charles Scribner's Sons publishing company signs books for the Friends of the Library. Charles Scribner Jr. (center) of the Charles Scribner's Sons publishing company and his wife. Selma Algaze and Donna Grubmann pose for a photo during a reception. Dr. Scott Donaldson and Mrs. Donaldson pose for a group photo with professor of literature at The University of North Carolina Dr. Linda Wagner and her husband Robert Martin during a reception. Jean Wardlow and Al Dilthey of the Miami Herald attend a reception at the Pier House.